Some of the little dancing lady puppets (who were resident in my purse at the time), inhaled their breath sharply, shocked at such ignorance. M. stepped over to us, wrapping us in his arm as he replied, “oh yes, and we call an angel melek and many angels melekler” Repeating the Turkish words in a perfect accent, my niece looked at me and said “do you think there are both angels and ángeles and melekler here today, as M is Turkish and you and I are American and I have a Peruvian and Mexican family too?” I ventured that there probably were. I am pretty sure that I have a guardian angel, maybe even more than one. Although I fall more and more into the category of agnostic as the world rides towards me with reality, I still have some belief in this concept, as contradictory as all that may sound. I often feel that I am lucky – too lucky – for my own reality. Sometimes I think my mother is, as my Granny used to say “watching out for me” since her death twenty-some years on. Sometimes, though, I think I am just a privileged, educated, lucky White girl in the right place at the right time. Sometimes, I wonder about magic. Sometimes, I wonder if all of these things aren’t all a bit of what’s true. I have never actually *seen* my potential guardian angel, but I do have a stand-in. And that stand-in is a wooden statue. 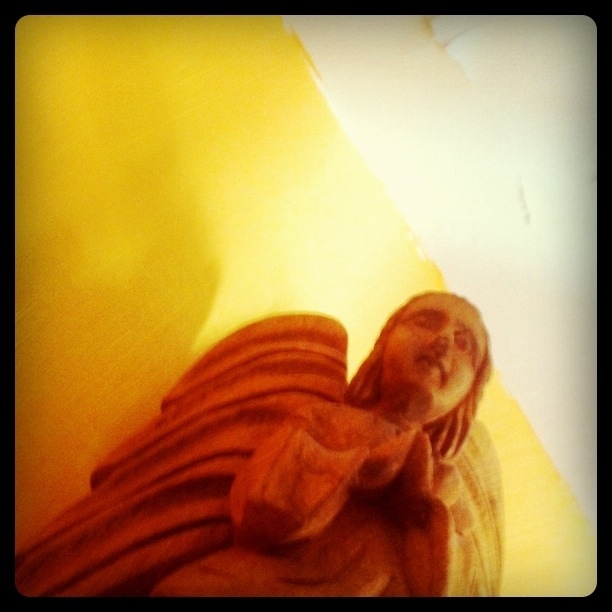 My very own (wooden) guardian angel, gifted to me by an in-person guardian angel of sorts. And this was where I went in the split-second eternity that I spaced out, staring at saints and angels on the walls of the inimitable Aya Sofya in Istanbul…it took me way back and way far away…but I was interrupted by the pull of wonderful M. and our niece, who wanted me to take a picture of them goofing around. And it wasn’t until recently that I thought of that moment again, and decided to catch my thoughts (and the puppets) up about it all. Of course, here I am, it is many years later, and that angel – as well as my family and friends – guided me out of that bad situation and on into the very happy life I now lead with M. And that wooden angel that nodded to me, well, that angel is still with us here in our Turkish-American house. Esma, the Sufi hippie, gently places her arms around me at this point in my mental storytelling, telling me she loves me, and that she believes that angel did nod at me. Nowadays, as I grow clearer about my feelings about and call to (or rather lack of call to) the religion of my youth, I often look at my angel with more than a tad of guilt. I think about the dear woman who bestowed this angel upon me. I am sure that in some way she has a sense of the magic that came with that angel even if only in the form of self-awareness. However, I also think about her – and I feel guilty. I feel guilty that I do not go to church, and she is a minister. I know it would mean much to her, as it would to my mother now passed on. And I am also fairly sure that my mother asked this woman to watch over me as a guardian angel auntie of sorts, for which I am also grateful. But these days, I have started to admit to myself that I do not hear or feel a call to church and I find that I am more spiritually fulfilled by my work with students and social service agencies than anything else – not to mention my new-found practice of meditation – although I don’t practice it enough. Going to church would do nothing but make my family (and, I am guessing this in-person angel who gifted me the wooden one) happy. As I have commenced the process of blogging about cross-cultural marriage here at Slowly-by-Slowly, I expected to write a lot more about religion, but I now realize it has been percolating on the back burner stove of my brain for a while now as I am figuring it all out. After experiencing the worst in human interpersonal dynamics in the church of my youth, I think my guardian angel, if you will, started to guide me elsewhere. In my first marriage, I did make an effort to attend church some as it was important to my husband at the time, but to be honest with myself, I felt like a hypocrite when in church, as though I was going through motions that were not meaningful or heartfelt. These days, I am sure some might think that M.’s lack of religious faith plays into this, but the truth is, I was already on a different path. My father’s response to this, a few years back, when he was more able to have such talks, centered around the church as community – and community being the most important point. While this resonated with me as a concept, I have come to realize that for me, community is felt elsewhere. And that brings me back to the guardian angel who sits in our home. The wooden one. Sometimes, I wonder if that angel is waiting me out. Maybe she has a time-release capsule intended to put the “get to church” bug in my bonnet when the time is right. I wonder if that angel is watching me, biding its time, wondering just how many years this will take. I think about Nicolas Cage’s performance as an angel where he feels he has failed his mission…does my guardian angel feel this way? Once, and I am ashamed to admit this hearty bit of paranoia, I checked my wooden guardian angel to see if there was a secret listening device implanted in her – that would go straight to my in-person guardian angel, my mother’s friend who I consider to be an auntie. I quickly shook my head at my folly and blushed with embarrassment as I stood alone, pigeon-toed in the kitchen. “Maybe,” I thought, “I am losing my mind.” I am sure a few would line up to agree (Karagöz says, “yes, we do agree!“). And I am guessing, from her comments on several occasions, that my mother’s anointed human guardian angel probably thinks I have lost some of my mind in marrying M., a man from a Muslim country, based on her past experiences in observing cross-cultural marriages where there was a lot of pain about decisions made about religion and religious practices. Standing in the light blue-toned kitchen, caught in between a beam of sunlight and the shadows of orchids, I realized that what I am really thinking is this: “I would like to have faith that someday this important woman in my life will accept me as I am, for the good heart I have inside, even if I make a choice that steps away from my family’s religious tradition as an individual.” And I am also realizing that I have faith in acceptance of me even if I have chosen to marry someone of Muslim descent – a subject that has to an extent, come between us in difficult moments but remains unexamined. Moving to the stove, I prepare to make tea while a golden sliver of afternoon light ranges across my moving hands, realizing the time has come to talk to this auntie about my guardian angels wooden and human, Christian and atheist. She is, after all, coming for Easter dinner, the time of resurrection. So, I think to myself, let me use the metaphor of resurrection to get this friendship back where I would like it to be. This entry was posted in Family Challenges, On writing about my life with the Karagöz puppets, Visits from the Karagöz puppets and tagged Aya Sofya, cross-cultural, God, Guardian angel, istanbul, Karagöz, Nicolas Cage, Religion and Spirituality, Turkish American. Bookmark the permalink. . . I had my moment of epiphany when I was 13 years old. My dear abla had asked me to be god-father to her first-born son; I had declined because I was in turmoil about religion/existence of any god or gods and I was not prepared to make promises I might not be able to keep. She understood – my father did not and set about beating and kicking me (he was an alcoholic even whilst serving in the Royal Navy) saying that I needed to believe in something. It was the moment when that door closed and another opened – I have never once in the following 54 years had reason to doubt my decision. I can’t say I had quite the same experience, but I can certainly understand. in all my life (52 years) i’ve been in the mosque maybe 2-3 times for religious ceremony. even i was 6 or 7 years old i remember very well the first one. my father was not a religious person at all, but we went the mosque anyway and we didn’t even know what the occasion was. all i remember is that after the ceremony, we figured out that our shoes were stolen. we just didn’t know that going to mosque with your new shoes was a bad idea. I too, think I have a guardian angel even though I’ve been an atheist for all of my adult life. It’s a contradiction I am comforted by and live with quite happily. This seeming contradiction makes *perfect* sense to me!!! This must have been such a painful moment, on the immediate and on the more philosophical level as well. I too learned that the difference between the ideals discussed in religious texts and oratory are often different from the practices of humans – and this is especially hard to face in the context of religious spaces and places. I have come to realize that humans are humans, even in these spaces. I suppose an optimist might say that the teachings of the religions probably encourage us to be the best people we can be no matter what- but also encourage us to accept that nobody is perfect…no solace, I know. This is a powerful story – thank you for sharing it. Having spent time mesmerized by the space there, I can well imagine this occurring. This is a heartbreaking story. Just. Heartbreaking. That this happened to someone with such heart and soul as you is so sad for me to hear – but also likely the genesis of what led you to be the wonderful you that you are today. More offline and in person. I’m all for Carl Sagan’s proclamation! Thank you so much for taking the time to comment! I am glad to hear that I am not alone in this way. LOL on religion co-opting the guardian angels – an interesting notion. Looks like at least 2 of us here can relate to that! 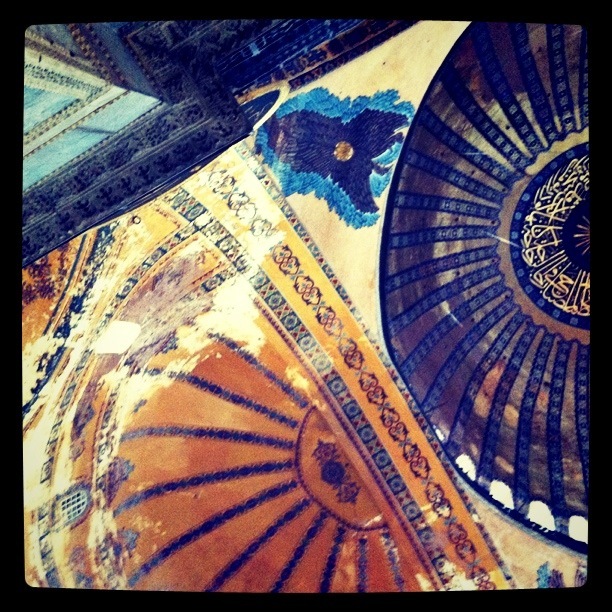 I also felt goosebumps and tingly when i was in the Aya Sofia. Already a religious person i put this down to centuries of positive energy circulating throughout the building. I believe every one of us, believer or not has a guardian angel. Well put! I can relate. Interesting so many resonate with this concept. How is this discussed in your experience of Islam, Rosamond? In Islam, believers say that God assigns two guardian angels to accompany each person throughout his or her life on Earth — one to sit on each shoulder. These angels are called the Kiraman Katibin (honorable recorders), and they pay attention to everything that people past puberty think, say, and do. The one who sits on their right shoulders records their good choices while the angel who sits on their left shoulders records their bad decisions. Muslims sometimes say “Peace be upon you” while looking at their left and right shoulders — where they believe that their guardian angels reside — to acknowledge their guardian angels’ presence with them as they offer their daily prayers to God. This is very helpful (and interesting) to know. I look forward to learning more! Thank you for sharing this information with me!